I sure am glad that you stopped by to help me out with the cooking project for our fall festival. I just love this time of the year when we have so many fun events in the area. There are festival's and carnival's and art and craft bazaar's. Today I am making pies for our fall festival, so I am happy to have some help. We can sit down and take a little break while we take a look at next weeks menu. 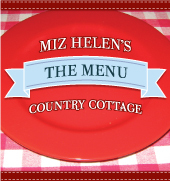 If you haven't gone to my new face book page to like Miz Helen's Country Cottage, I sure would appreciate if you would, its on the side bar. I am so happy that you stopped by to visit with us today and sure hope you will come back very soon! Great menu, as always, Miz Helen! Aren't you enjoying this cooler weather in Texas? This look like a great week eating cookies !! I love chocolate chip.. I just post my Halloween Tablescape maybe you can come see. This Texas lady hopes you have a great week. Sounds like great stuff at your house this week! Wow! Two great recipes! I love pork chops in a crock pot. Thanks for sharing. It sounds like it is going to be a very yummy week at your house, Miz Helen! I especially like the sound of that lovely, warming Southwest Chicken and Potato Soup. Thank you for sharing this post with the Hearth and Soul hop. Yum, you have a great looking menu lined up Miz Helen. Me and my hubby are both drooling over your Slow Cooker Pork Chop Dinner. It will be making an appearance on my menu soon. Have a great weekend! Looks like a great menu!What a good week! These eats look great, Miz Helen! Thanks so much for sharing them.